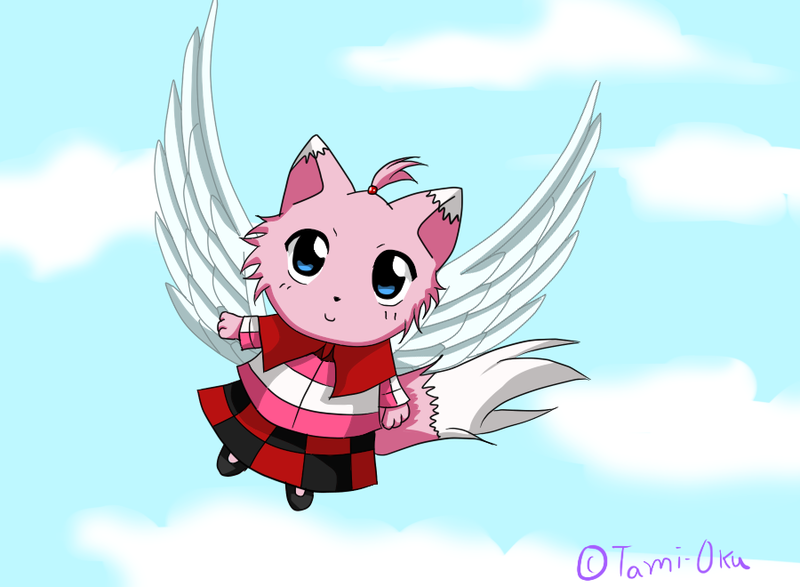 Type of Wizardry (if any): Lily, like any exceed, has the ability to sprout angelic wings and fly. It is really quite simple, she can grow wings whenever she wants but can only fly for a limited time. Also she learned a form of light magic along her travels. She has the power to illuminate anything around her. She can summon all of the light around her to form a concentrated beam to fire at an enemy. She has various modes of beams such as long range to scatter. Each of these requiring more and more energy. She can also make a shield around herself and one other person, keeping any magic based projectile out. She can cover her wings and paws in pure light, allowing her to attack anything in front of her. Despite all this, her magic really isn't strong and she is more of a sidekick. Lily is a very small exceed, being even smaller than the already tiny race. Lily has pink and white fur, covering multiple parts of her body. She has deep blue eyes and a small pony tail at the top of her head. She has a bushy white and pink tail and small paws. She wears a pink and white striped top that Gwen made her. She also wears a red mini jacket thing she wears over her top. This was also made by Gwen. In addition to that she wears a black and red skirt and black shoes, both made by her friend Gwen. She also has a small read backpack and fairy tail insignia of a white color on her back. Personality: Lily is very shy. She will never talk to anyone but Gwen of her own accord. She speaks very quietly when she does, and doesnt enjoy that kind of thing. She is very submissive and will normally agree to things. Despite her shyness, she is very peppy and friendly and will be nice to anyone who talks to her. She isnt the best at public speaking and speaking in general. She will be hiding behind Gwen or hiding in Gwen's hair. Lily is always supportive of Gwen, who she calls Mama despite seeing her as a friend. There are only two chances where Lily's confident self will show, when protecting Gwen from perverts, or when she is put to a life threatening chance. Despite this, Lily is a very smart cat, possibly being smarter than Gwen. All of this knowledge disappears however when she is around others, especially her crush Happy. History: Lily was hatched from an egg by the dragonslayer Gwen Varimathras. Gwen was raised by the dragon Helios but she left shortly before Lily was born. Lily, like many exceeds, was originally sent to Earthland by the kingdom of exceeds in Edolas. Lily had no knowledge of this events. When Lily's egg first arrived in Earthland, it was found by a sleeping Gwen. Gwen raised her until she hatched. When Lily first came out, she thought that Gwen was her mama. She kept calling her mama, as Gwen was the one raising her since birth. After awhile of growing up, Lily began to see Gwen as a friend and not a mother, despite Gwen caring for her all this time. Eventually, Lily got separated from Gwen, and for the first time, Lily was on her own. She roamed along, yelling for her mama as much as she could, until she found a light mage. The mage was roaming in the woods and decided to help the little exceed. She taught her how to use basic forms of light magic. Lily is a very slow learner and only managed to learn the bare minimum of light magic until she found Gwen. She went out flying one day and saw Gwen heading towards a town called Magnolia. Lily went and found Gwen and showed her new magic. They decided to become partners once more and she is now joining Fairy Tail.